Wow! This thing is fantastic. But first I must say that after using a Macbook Pro at work for the last few weeks I will never, ever by another PC for use at home again. They may have a premium but I get it. One thing I did find missing once I “docked” the Macbook Pro was the inability to use gestures on the trackpad. 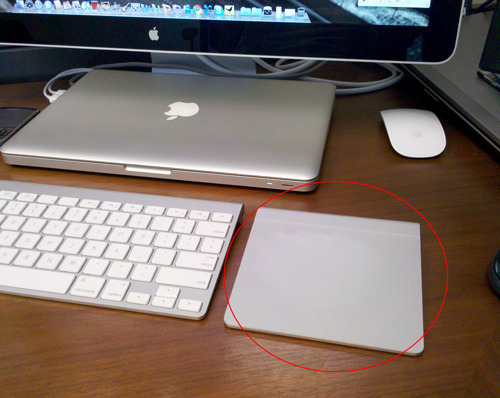 Well this Magic Trackpad fits the bill perfectly and I never thought this would happen. I no longer use a mouse. Sure, there are a few things a mouse will be better for when doing graphics editing but other than that the mouse is pushed aside. This gestures capability that Apple systems have is just fantastic. It is so natural and within moments your hands just know what to do. In fact, it has now become frustrating when I use a PC since my reaction is to start using gestures…. to no avail.